ESQUIVEL is a sleek near-script inspired by an older Esquire magazine logo. 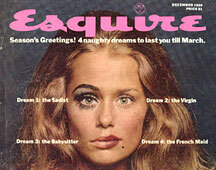 Working from this December 1968 issue (with Lauren Hutton on the cover) I had only the title and one short heading inside to work from. The title evokes the original source, but pays homage to Juan García Esquivel, the Mexican emigré “multi-threat talent: quirky composer, eccentric arranger, enchanting performer, dashing showman” according to the liner notes (by Irwin Chusid) of Esquivel’s 1995 greatest-hits CD Cabaret Mañana. Works well italicized too. And there’s also the Engraved and Condensed versions too.